Farmers throughout Ohio use anhydrous ammonia (NH3) as one source of nitrogen fertilizer for crops. All associated personnel should be familiar with the safe use of anhydrous ammonia, understand the potential for injury and know how to respond to an emergency. Anhydrous ammonia is caustic and will cause severe burns to the eyes, skin and respiratory tract. Anhydrous ammonia is a strong alkali that can cause death or severe injury to body tissue due to its caustic, corrosive, freezing, and dehydrating action. Its strong affinity for water and rapid evaporation creates an almost instant freeze-drying effect when the liquid NH3 comes in contact with body tissue. Handling the hose by the valve handle or hand wheel. Moving the tank before disconnecting the hose. Faulty valves and deteriorated or out-of-date hoses. Failure to bleed pressurized NH3 from the hose before connecting or disconnecting. External overheating of the storage container. Faulty hitch pin or weakened tongue. Not using personal protective equipment. Failure to have sufficient amounts of water available. An estimated 80 percent of reported incidents result from improper procedure, lack of knowledge or training, and failure to follow proper safety precautions. Hazardous incidents can be reduced if all individuals follow safety rules and maintain the equipment properly. It is essential that all equipment be in good operating condition. Only trained individuals should handle and apply anhydrous ammonia. Personal Protective Equipment (PPE) creates a barrier between the chemical and the human body. Goggles, rubber gloves and other chemical resistant protective clothing are necessary when handling anhydrous ammonia. It is recommended that goggles and a face shield or an approved full-face respirator be used to protect the eyes and face from a direct blast of ammonia. Never wear contact lenses when handling anhydrous ammonia, since they can trap the gas and freeze the contacts to the eye. Contact with just a small amounts of anhydrous ammonia can permanently blind and disfigure an individual. Washing with water is the emergency measure to use when skin or eyes are exposed to anhydrous ammonia. Time is important! Get water onto the exposed area of the skin or eyes immediately and flush for at least 15 minutes. Contaminated clothing should be removed quickly but carefully. Thaw clothing frozen to the skin with water before attempting removal. Wash the affected skin area with abundant amounts of water and do not apply anything except water for the first 24 hours. Stay warm and get to a physician immediately. Water must be available for flushing the eyes and skin in case of exposure. Each vehicle used for anhydrous ammonia must carry a 5-gallon container of clean water. Anyone handling NH3 should carry a 6- to 8-ounce squeeze bottle of water in their shirt pocket for rapid emergency access. A regular, scheduled maintenance program will ensure the tank, the valves and all hoses are safe for handling the high-pressure liquid and its vapor form. It is imperative that all equipment, when in use, be given a daily visual inspection to locate any defects in the tank or hoses. The most important components of a routine maintenance check are listed below. Tank Valves, includes Liquid Withdrawal Valve, Liquid Fill Valve, and Vapor Return Valve—Be sure valves are functional and will shut off. Any leak detected in the valve is cause for immediate repair or replacement. Each valve should be removed every five years and inspected for internal corrosion and thread deterioration. Excess flow valve—Check the valve for movement of the valve plunger, corrosion of springs, valve seat and guide, and out of round disk. This valve should be replaced every five years. Pressure Gauge—Check the consistency with other tanks of similar volume. Make sure the lens is clean and the dial face is clearly readable. Fixed Liquid Level Gauge—Clean, repair or replace as needed. Liquid Level Float Gauge—Check against the 85 percent level gauge for accuracy. An inaccurate reading, leaking at the seal, or unreadable lens should be repaired or the defective item replaced. Safety Relief (SR) Valve—Stand to one side and use a mirror for viewing. The SR valve should be free of dirt and rust. Replace the rain cap if it is damaged or missing. Leakage or discharge below 250 psi is cause for replacement. The SR valve should be replaced every five years. Hydrostatic Relief (HR) Valve—Inspect the valve for leakage, corrosion or damage. The HR valve should be replaced every five years. Transfer Hose—Examine the hose closely for cuts, abrasions, soft spots, bulges, kinking or flattening and similar defects. Check for slippage of the hose at coupling. The hose must be replaced five years from the date of manufacture (stamped on hose). Tank Condition—Prevent corrosion and excessive pressure buildup from direct sunlight by keeping the tank painted with a reflective paint. Dented or damaged tanks should be taken out of service until checked by an authorized inspector and repaired as necessary. All welding on the tank must be done by a certified welder. Be careful in repairing or replacing these parts to prevent accidental exposure to anhydrous ammonia. Most retailers will assist you in repairing your nurse tank or applicator. For a more detailed explanation, refer to The Fertilizer Institute’s publication, External Visual Inspection Guidelines for Anhydrous Ammonia Nurse Tanks Applicators Tank Appurtenances. Federal Department of Transportation (DOT) requires NH3 to be marked consistently across all states. These markings are listed below. Nurse tanks must be labeled “ANHYDROUS AMMONIA” in 4-inch letters, on contrasting background, on the sides and rear of the tank. The words “INHALATION HAZARD,” in association with the anhydrous ammonia label, in 3-inch lettering be placed on both sides of the tank. 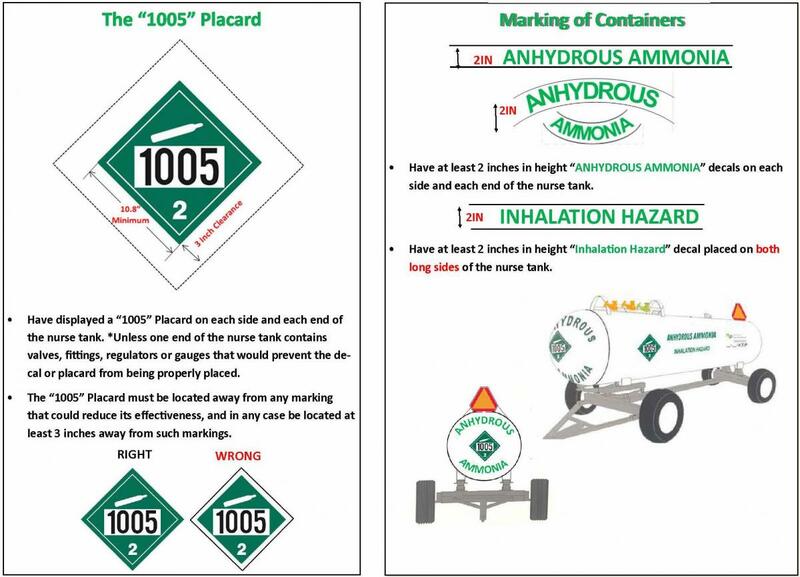 A DOT approved “NON-FLAMMABLE GAS” placard with the numbers 1005 (identifying it as anhydrous ammonia) must be located on both sides and both ends of the tank. A Slow Moving Vehicle (SMV) sign must be prominently displayed on the rear of the tank with the bottom of the sign at least 2 and not more than 6 feet from the ground. The valves must be appropriately labeled by color or legend as vapor (Safety Yellow) or liquid (Omaha Orange). The letters of the legend must be at least 2 inches high on contrasting background and within 12 inches of the valves. Graphics courtesy of Ohio Department of Agriculture: Summary of Nurse Tank and Tool Bar Requirements. An operator’s manual should be available, ideally with the equipment, for reference at all times. A safety-type hitch pin with a standard safety chain attachment for the nurse tank wagons or running gear. In addition to the mandatory SMV sign, appropriate lighting for travel on roadway must include at least one red tail lamp and two amber flashing warning lamps. These may be on the towing vehicle or the tank wagon, but they must be visible from the rear. Additionally, the tank wagon must have at least two red reflectors visible to the rear. Turn signals, flashing warning lights and a red brake light are recommended on all anhydrous ammonia tank wagons which are towed on public roadways. To accommodate these lights, a standard seven terminal breakaway connector plug should be used on the tank wagon. At least one safety sign should be located in between the control valves and the 5-gallon water supply. Always have water readily available. This should include a squirt bottle of water with you and 5 gallons of emergency water mounted on the nurse tank. PPE should include: long sleeve clothing, goggles, chemical gloves, and respirator with approved cartridge. Have a back-up pair of personal protective equipment to use, if needed. Wear the proper PPE when connecting or disconnecting nurse tanks from the applicator or when making minor repairs or adjustments in the field. Ensure that a set of PPE is located in the cab of the tractor and in any vehicle used to transport nurse tanks. Follow the recommended procedures for connecting and disconnecting nurse tanks and applicators. Shortcuts can lead to unintended release or unexpected exposure. When changing nurse tanks or making field repairs, always work upwind of the applicator and the nurse tank. Applicator knives, flow meter, hose connections, bleeder valves, and nurse tank valves can be exposure opportunities for an unintended release. When changing nurse tanks, park the tractor upwind before opening bleeder valves or disconnecting hoses. This can minimize the chance of anhydrous ammonia from entering the cab. Watch for pinch points and crush points when hitching the nurse tank to the applicator. Point the hose end away from you and make sure connectors and connection points are clean when coupling the nurse tank hose to the applicator. Hand-tighten valve handles. Overtightening with a wrench can cause damage to the valve or seals. Inspect and replace hoses and valves as needed. Bleed off pressure in the hose before disconnecting it. Ensure hitch pins are secure and secondary chains are attached before moving the nurse tank. Park nurse tanks (empty or full) downwind and away from neighboring houses, public areas and businesses. Running Gear—Inspect the farm wagon frame tongue, reach poles, anchor devices, wheel bearings, knuckles, ball joints and pins for structural damage, cracks, excessive wear and adjustments. Tires—Check for proper inflation. Check tire tread for cuts, badly worn spots, and signs of weathering. Assure that lug nuts are tight. Lubrication—Steering knuckles, wheels, tongues, or other applicable farm wagon equipment should be lubricated at least once every year. Nowatzki, J. (2011). Anhydrous Ammonia: Managing The Risks. Fargo, ND: North Dakota State University. Schwab, C. A., & Hannah, H. M. (Revised 2013). Safe Farm - Play it Safe with Anhydrous Ammonia. Safe Farm. 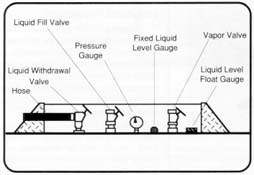 The Fertilizer Institute (TFI), External Visual Inspection Guidelines for Anhydrous Ammonia Nurse Tanks Applicators Tank Appurtenances. 501 2nd St. N.E., Washington, D.C. 20002.